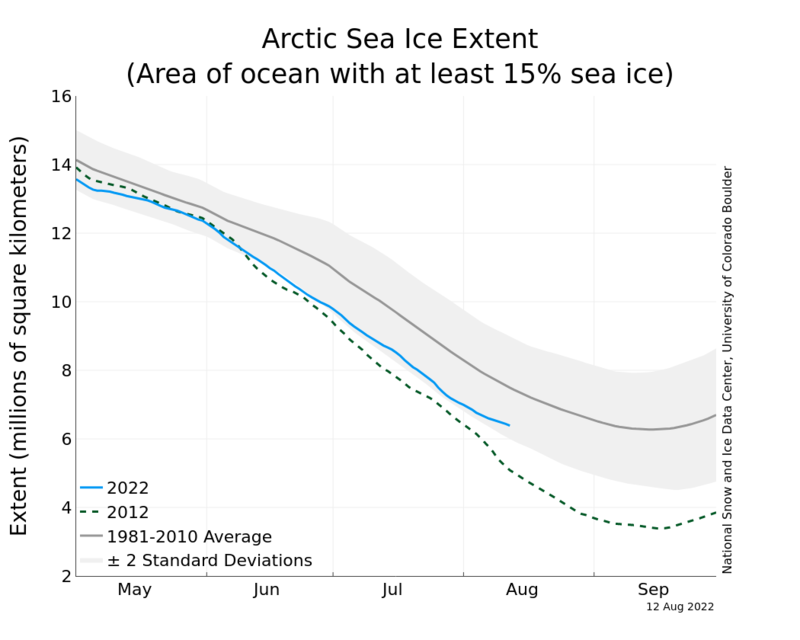 Arctic sea ice extent was marginally at a record low extent for the date as of August 1. This week’s big storm will likely keep Arctic sea ice at record low levels for the next week or two. A remarkably intense low pressure system formed in the Arctic north of Alaska Monday, bottoming out with a central pressure of 963 mb at 2 pm EDT. A pressure this low is rare any time of the year in the Arctic, and is exceptionally so in summer. The storm is stacked vertically with the upper-level low, and will spin in place and slowly weaken over the next few days, but remain unusually strong. Strong winds behind the low’s cold front caused a 1.3′ storm surge Monday inPrudhoe Bay, on Alaska’s north shore. As noted in Neven Acropolis’ sea ice blog, the strong winds around this low have the potential to cause a large loss of Arctic sea ice, due to churning, increased wave action, pushing of ice into warmer waters, and the mixing up of warmer waters from beneath the ice.